After reports came out Thursday that Toyota and Mazda would team up to build a $1.6-billion U.S. assembly plant, the two announced it Friday morning. Reuters reports that in addition to it, Toyota will take a 5-percent stake in Mazda and Mazda, the smaller of the two, will take a .25-percent stake in Toyota. Toyota announced in January that its plans to spend $10 billion in the U.S. over the next five years weren’t in response to President Donald Trump’s pressure to relocate back to America, CNBC reported at the time. The plant will be capable of producing 300,000 vehicles a year, with production divided between the two automakers, and employ about 4,000 people. It will start operating in 2021. The electric vehicles cooperation, meanwhile, comes as the tightening of global emissions regulations prompts more automakers to develop battery powered cars, as the industry struggles with hefty research costs and intense competition from technology companies over technology like self-driving cars. 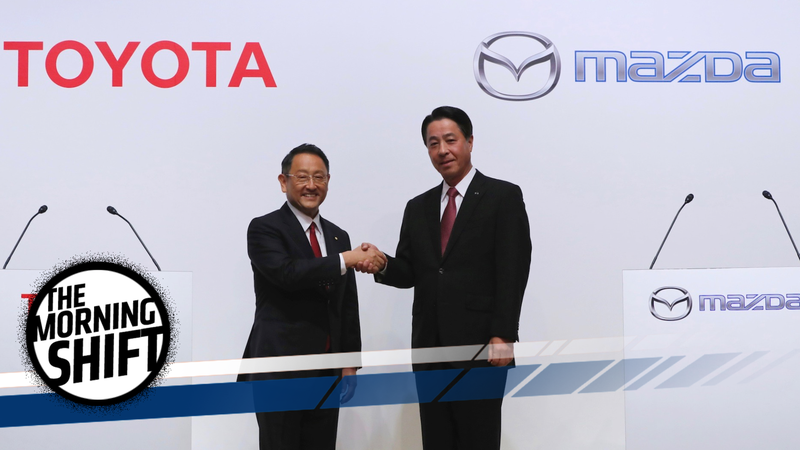 As part of the agreement, Toyota and Mazda will also work together to develop in-car information technologies and automated driving functions. Whether it was his pressure or not, Donald is very happy. He probably won’t block Toyota or Mazda on Twitter in the near future. Not sad! Nearly 2,000 Chicago-area mechanics went on strike Tuesday, with Automotive News reporting that it affects about 130 of the 420 new-car dealerships in the area. The strike was still going on Thursday. Most of the debate centers around scheduling and work hours, which unionized mechanics aren’t thrilled about. Rather than offering, you know, a change in work scheduling, Automotive News reports that a committee representing area dealerships proposed a three-year contract that promised wage increases of 5 percent annually. That got rejected by the mechanics. The union is mainly pushing for a guaranteed 40-hour work week, a change [Chicago Automobile Trade Association presiden David] Sloan said could eliminate the current system, which rewards a dealership’s most productive technicians with more hours. Dealerships have “draconian pay structures prohibiting our ability to attract young, aspiring mechanics to enter the auto repair profession,” according to a statement released by the union. Volkswagen executive Oliver Schmidt has a court date Friday morning, and the Detroit Free Press reports that he’s expected to plead guilty in the manufacturer’s giant diesel cheating scandal. But, naturally, this rich and well-known executive will be pleading guilty to far lesser charges than we originally thought. Schmidt was originally charged with 11 felonies and up to 169 years in prison for his role in the Dieselgate scandal, but now, the Detroit Free Press reports that he’s down to two charges—conspiracy and violating the Clean Air Act—and possibly no prison time. Sounds just peachy, Oliver. The most serious charge, conspiracy, carries a possible sentence of up to five years in prison and/or a $250,000 fine. In February, The New York Times reported that Schmidt’s lawyers said he “merely did what Volkswagen lawyers told him to do” during meetings with regulators. Schmidt sure will have fun dodging all of that prison time in the next few hours. Go forth and help secretively pollute our earth, friend. Tesla’s stock is soaring just like its Model 3 reservations, because investors have a lot of faith in the guy who wants to dig a giant hole from Washington, D.C. to the middle of New York City when he’s not working in the car business. The Palo Alto, California company late on Wednesday reported quarterly results that beat average analyst estimates, and said it received more than 1,800 reservations per day for the Model 3 since its launch last week. Tesla had $3 billion in cash on hand at the end of the June quarter, reassuring investors who were worried after Musk warned on Friday that the automaker would face six months of “manufacturing hell” in ramping up production of the Model 3. 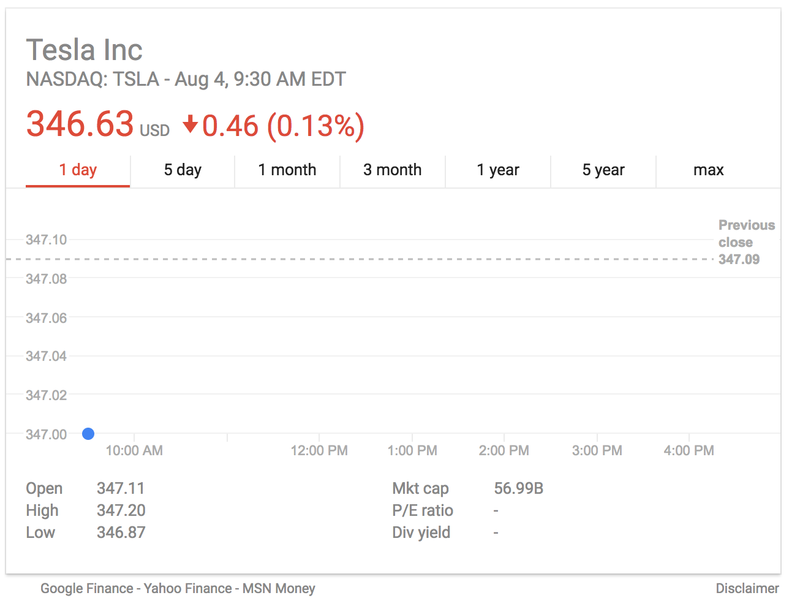 Tesla’s cash burn, expected to top $2 billion this year, has prompted short-sellers like Greenlight Capital’s David Einhorn to bet against the company ... and some analysts expect the carmaker to seek extra funding this year. Musk said investors should have “zero concern” Tesla would fail to reach its production target of 10,000 vehicles each week by the end of 2018. Totally. Don’t be concerned at all, Wall Street. Ferrari won’t make autonomous cars. Boss Sergio Marchionne said you’d have to shoot him first. Ferrari also won’t make an SUV. But, actually, Ferrari will. Alright, Ferrari, we get it. You’re cool and you don’t do the things other people do. Thanks for the reminder. On Aug. 4, 1994, the New York Times reported that the flatbed on a truck carrying 24 million bees tipped over on a New York highway. The truck was on its way to Florida, but the whole bee accident happened near Tarrytown, New York. The New York Times reported that drivers were backed up for miles while police told them all to keep their windows rolled up. Fun! Neutral: Has The Chicago Mechanic Strike Affected Anyone You Know? Is this big ordeal making the impact mechanics say it is? Do you know anyone who’s been out of a car repair over the past few days? Correction: We originally attributed the Chicago Tribune quote above to just a mechanic. The person who said it, Sam Cicinelli, is a former mechanic and the union’s business representative.